Curiel is the 10th division commander of the Whitebeard Pirates. He is a large and sturdy man with glasses who wears a bucket hat over his head and a pair of ear protectors that resemble a pair of modern headphones. 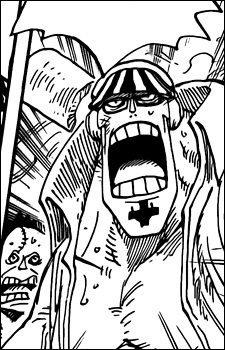 He also has the Whitebeard jolly roger tattoed on his chin. He wears a vest and spotted army pants. Like all division commanders of the Whitebeard Pirates, Curiel seems to be very loyal to Whitebeard, as when he battles against Moria he said he will let neither his captain nor his nakama Ace go to their deaths.